CAPP is excited by the opportunity to provide feedback on the Fishermans Bend Draft Framework and to participate in ongoing discussions of the largest urban renewal project in Australia. CAPP acknowledges the enormity of the undertaking and the excellent work done in reaching this point of planning for the future of Fishermans Bend. 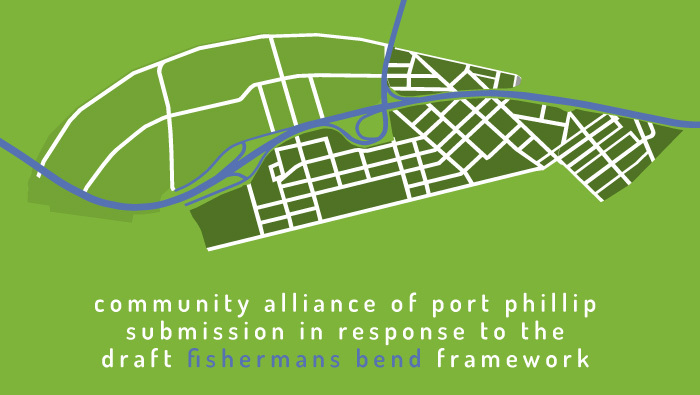 CAPP endorses the 2016 Fishermans Bend Vision and we are broadly supportive of the Draft Fishermans Bend Framework. We commend the forward thinking it represents in the future shaping of Fishermans Bend. Action taken in developing the Fishermans Bend precincts can, and should provide a model of excellence for other urban renewal projects right across Australia. It should also provide leadership for local councils as they tackle issues such as the provision of an adequate supply of social and community housing, increasing residential densification, sustainable transport and environmental damage and waste. City-shaping infrastructure, such as integrated environmental systems, public transport, schools and public spaces predetermine the form and character of the city we build and the needs and capacities of the communities we house. Lead with these and the development market will follow. Precinct-by-precinct staging will allow essential infrastructure to be delivered economically and effectively. CAPP sees community infrastructure as a high priority and endorses many of the proposals made in the Framework to ensure adequate infrastructure. CAPP is pleased to see that the Framework notes that Fishermans Bend is not a blank canvas, recognising Indigenous people in the Caring for Country statement and the historical and social context, but CAPP is disappointed not to see these statements translating into clear guidelines and actions. There could be much greater recognition and incorporation of the existing building fabric of the area, including the light industry heritage of Fishermans Bend. Providing greater respect for the history and heritage of the area could lead to exciting and innovative urban design. CAPP is concerned that there is no financial plan presented with the Framework. It is imperative that this is addressed with urgency. The State Government must be the key funder of this major project. State Government in partnership with the City of Melbourne and the City of Port Phillip must ensure that the financial resources are provided up front to ensure investment in essential infrastructure from the outset.